Just saying hi, I have owned my Altezza for 6 months and still haven't signed up here so thought I would. I hope to contribute some info during my ownership as I have used the forum a lot and find these club forums excellent when you need to know something. Anyhow, I have a Altezza Rs200 which I intend you use rather than polish. I have HSD coilovers fitted, Rays TE37's, HKS exhaust system and other than that is pretty much standard apart from the odd bit. Its running LPG too which is excellent, the cheapest car I have ever run! I just flick it on to petrol when I want to give it some stick. Also it has full leather inside, is this an L-Edition? How can I find out? 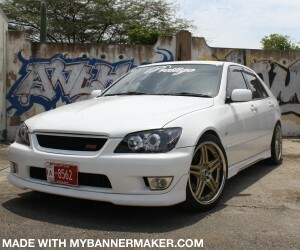 welcome.. clean tezza.. you can check on the plate under the hood for its edition..
Nice Altezza, love the wheels. and welcome, from a fellow new guy. Does anyone else have full leather? I only seen part leather and cloth?